"Steve Chandler's words of wisdom and motivational techniques have guided me as a public servant and helped me to achieve my goals. If you want to grow as a person and make a difference in the world, put this book on your reading list right now!" "Steve Chandler lights you up with the glow of his internal neon. One of the funniest men I've ever known what he proposes is so rock solid and reassuring." "If you take the best of Wayne Dyer and add it to the best of Anthony Robbins, what you would have would only be half as good as Steve Chandler." "100 Ways to Motivate Yourself is wonderful, inspirational, honest, and courageous. It speaks from every page. It is definitely a book I will recommend to my clients and friends." In this first-ever paperback edition of his long-time best-seller, motivational speaker Steve Chandler helps you create an action plan for living your vision in business and in life. It features 100 proven methods to positively change the way you think and act. Methods based on feedback from the hundreds of thousands of corporate and public seminar attendees Chandler speaks to each year. 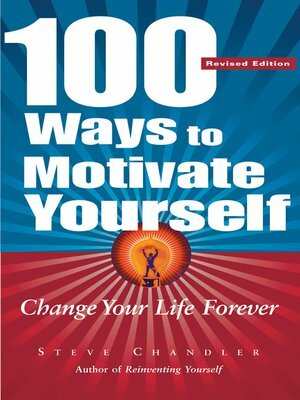 100 Ways to Motivate Yourself will help you break through the negative barriers and banish the pessimistic thoughts that are preventing you from fulfilling your lifelong goals and dreams. Whether you're self-employed, a manager, or a high-level executive, it's still easy to get stuck in the daily routines of life, fantasizing about what could have been. Steve Chandler helps you turn that way of thinking around and make what could have been into what can and will be. If you're ready to finally make a change and reach your goals, Steve Chandler challenges you to turn your defeatist attitude into energetic, optimistic, enthusiastic accomplishments.